Don’t miss out on a great purchase…get notified as soon as new items are posted! StampStore has now released a new feature, the Want List! Would you like to be notified each time items matching your interests are posted to the site? 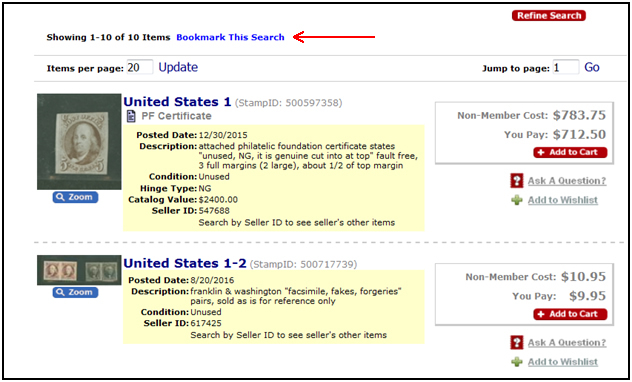 You’re now able to create StampStore searches for items that you are interested in, convert those searches to your Want List, and we’ll use that list to notify you when new stamps matching your criteria go up for sale! SEARCH - Visit www.StampStore.org and enter search criteria for items of interest. For example, as shown by the red arrows, we have selected to view "United States, Scott # 1 through 15, condition Unused". Once criteria is entered, click Search. SAVE SEARCH - You will then see the results of your search. Now click "Bookmark This Search" at the top of the screen; you will then be prompted to name the search. Here we have named the search as "US Scott 1-15 Unused". Setting a bookmark does two things - it saves your search for immediate viewing the next time you log in and also prepares it for converting to a want list. As shown on the illustration below, you can see that the next time we logged in at StampStore.org, at the top of the screen it displays our "Saved Searches" where we can click the little arrow to see the "US Scott 1-15 Unused" which we just saved. To view the saved search simply select it, click "Fill Search" and click the Search button to view it again – easy! Convert Search into Want List – Now we will actually convert your Saved Search into a Want List. Scroll to the very top of the screen and go to MyAPS; from the blue tabs in this area select "MyProfile". On the Profile screen you will see your general contact information, address, and collecting interests. If you scroll down, you will now see the "Search/Want List Management" – here you can view/delete saved searches or convert them to Want Lists. Simply use the pull down under "Saved Searches" to locate the saved search you wish to convert. Once you highlight it simply click "Convert to Want List" – your screen will automatically refresh and you will now see your saved search under the Want Lists. Each time StampStore loads new items that match your criteria, you will receive an email notifying you that new items have been added and providing a direct link to see the newest items posted within your criteria!